I finally got it. The Mossberg 464 SPX. I have already put a box of rounds through it, and I’m quiet happy with it. Functionally it was flawless, which was a huge step up from the last Lever Action I bought, the Marlin 1895, which immediately had to go back to the factory for 6 weeks. The accuracy was very good. I have to say that I really like the way this thing shoots. It was shooting very accurately off hand. But I need to get to a range that actually has a Bench so I can really see what this thing will do. As you can see, I didn’t get the version with the flash-hider. Because I thought about it and admitted to myself that I will never be doing anything with that threaded end anyway because if I want to go quiet, well, I’ll be using a very different weapon for that sort of work. This is going to strictly be for hunting. So I saved 50 bucks on got the shorter option. I like the shortness of it. It feels extremely short. And light. WOW, this rifle is light. Seriously… it’s like 1/2 the weight of a Marlin 336. I threw a tac-light on it just because, well, I can. Other than a sling, that’s going to be the extent of add-ons. I’m not decking this thing out. In fact, I may remove the rails all together. I’ve not decided yet. The stock has GOT to GO! I really can’t tell you how much I hate this ATI stock. It detracts from the entire rifle. I thought I had a Magpul CTR stock here at the house, but I think I remember that I had given it away back in Jacksonville to a guy in my church. So I will be needing a replacement stock as soon as possible. I don’t care if it’s a standard M4 stock or even a TAPCO… anything is a step up from this ATI. Stocks should not rattle and wobble. Ever. 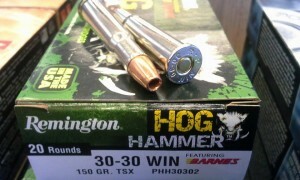 Along with the rifle, I grabbed a box of Remington HOG HAMMER ammo, as well as my favorite Federal Blue Box stuff for further plinking work. I was going to get some Hornady LEVERevolutions for it… but I’m well familiar with how they perform, and wanted to try something new. This gun will be used to harvest some delicious Venison this fall. And with the Carolinas not having a limit on White Tail… I think I’m going to be harvesting a lot. At least that’s the goal. The hope. One buys a rifle like this not for the collector value, but for the hope of adventures that one can have with it. I think I’m going to paint it. Just need to decide on how I’m going to go about it. Previous PostGun Buying RegretsNext PostWhat’s your Destination? I have a few spare stocks on hand if you would like but I would need to know if the tube is milspec or commercial. SC does have a very liberal deer hunting season (Aug-Dec) and it is true that you can shoot a buck a day for the entire season, but does do require a doe tag. If you can commit I can more than likely get you on a deer/hog combo hunt down in Estill in September for a weekend and it will only cost you gas & ammo (and you’ll be able to shoot on their range…should go out to 1000yds by summer time). It’s the same place that I got my 500+lb hog & all of my deer. I’m pretty sure these are commercial spec stocks on the SPX’s. Deer and Hog? I’m so in. I found a commercial unmarked M4A1 stock that has your name all over it. If you’re sure you can get the weekend off (Friday-Sunday, should be towards the end of September) then I’ll get started to get you on the hunt. I believe I should be good that weekend. Roger that, I’ll make it happen. I should still have your mailing address so I’ll get the stock boxed up and out to you in the next day or so. Awesome. Take your time. I’m in no rush for anything. And thank you. I look at it and I think Firefly.. Yes, I still have it. To answer your first question, it’s Commercial Spec, not Milspec. After having it for some time now… a few months past a year… let me give you the update. I’ve not fired it very much. I’ve only put about 8 boxes through it, which is about 180 rounds. To me that is not much at all. To the Rifle, that is not much at all. To most guys though, that’s probably a whole bunch if they only shoot their .30-30 during hunting season. The gun has only become BETTER. It’s smoother. It’s more accurate as the trigger has improved and the barrel has broken in. It is EASILY the most accurate out of the box lever action that I’ve ever had. I did have one lever that was just as accurate, but it had A LOT of custom gunsmithing done to it by a pro and it had a special target crown cut for it. This Mossy – is just as accurate as that one. MAYBE just a tick more so. I’ve had ZERO problems with it. Zero malfunctions. And I have been completely satisfied with what I purchased. However, that being said… I would LOVE to get it refinished in high gloss black and have some very nice wood stocks put on it. But as it sits – a Tactical Lever, a Beater Gun, a Working Rifle – It is PERFECT. I recently purchased one as well and have yet to fire it. Trying to find a spot. Anyways I don’t care for the style of the buttstock. Can I get a M4 stock from Magpul or is there one specific? You can put a Magpul on it, yes. Commercial Spec.